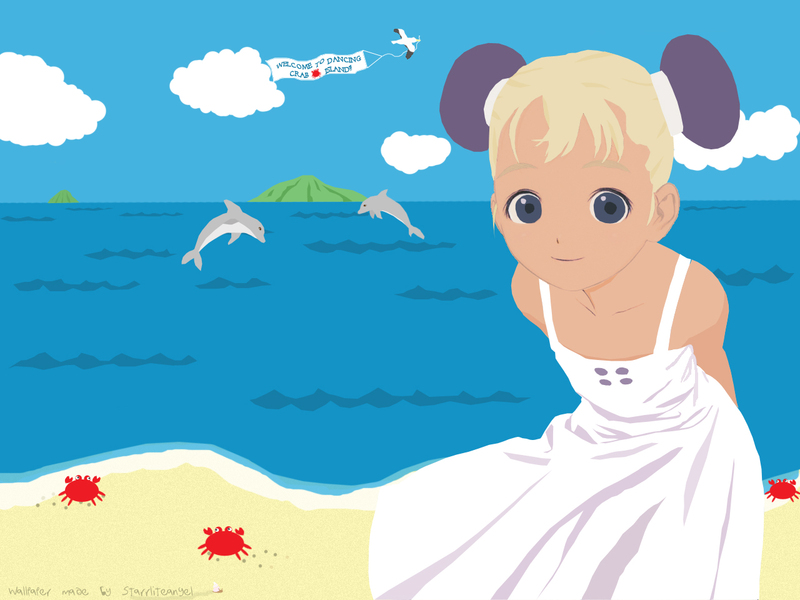 Last Exile Wallpaper: Welcome to Dancing Crab Island!! Minitokyo »	Last Exile Wallpapers » Last Exile Wallpaper: Welcome to Dancing Crab Island!! Actually, I really didn't and still dont know how to vector. lol X-P i know that sounds wierd because well...duh, the wall is VECTORED, but..um..hehe I just kind of made new layers over the original pic, outlined it with the pen tool, and filled it in with color.....is that how youre supposed to vector? uhhh i dunno. :sweat: hopefully it looks like a vector. um so anyways, i was going to name it somewhere on the lines of "breezy island" or "breezy something", but i dont know...you dont really see a breeze do ya? I dont anyways. ehhhhh...yep, so please take a lookie. oh yes, the entire background was handmade. only the character was actually taken from another pic. Browse Last Exile Gallery: Recent | Popular. This is your first vector wall? nice vectored wall, for your first! i love these cute ones on the beach! Wow...this is your first vector? Well, it's pretty good. It's so cute and colorful. :) Keep it up!